Don’t you hate cleaning out your freezer? I do. I dread the day. However, its better than cleaning out the fridge. At least the freezer stops the growth of anything green and fuzzy…. So I tossed and organized and now, well its clean… for a little while. 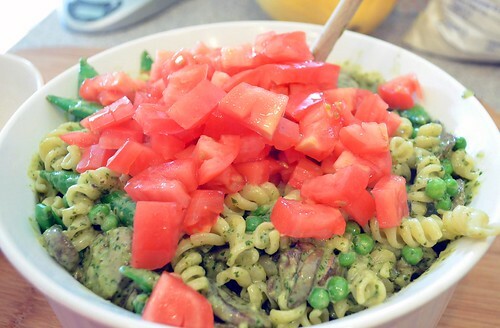 I did unearth a few things…I found some pesto! I had a feeling I had some in there, but couldn’t have guessed where exactly. Maybe I should clean the freezer out more often, or at least keep it more organized…Organization, I try … its just not my cup of tea. You should see my closets – eek!! 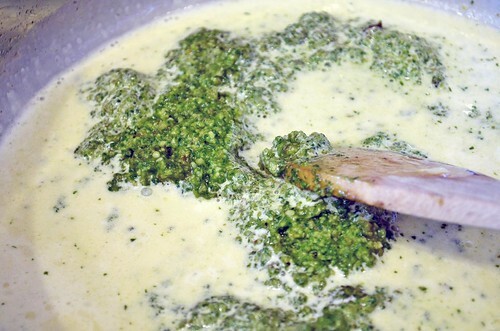 But the pesto…I had to use it, like instantly. I just couldn’t wait and I knew exactly what I wanted to make. 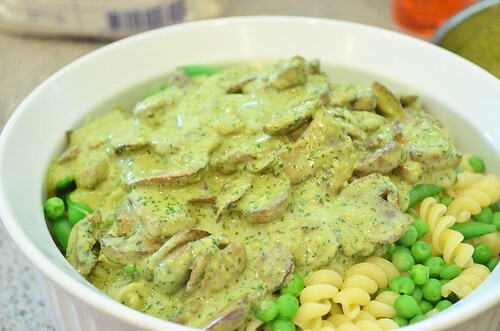 A creamy pesto sauce. Absolutely delicious. 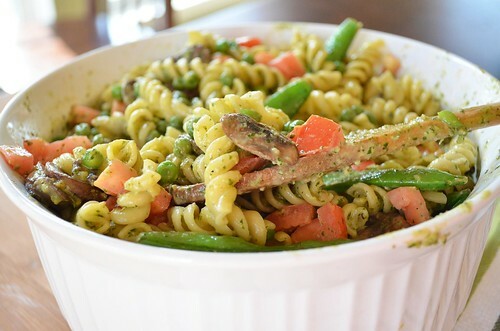 I couldn’t wait to make this and neither should you… It comes together in a snap and will feed a crowd! Anything better than mushrooms sauteed in a bit of butter? Nopers…So do it. Heat cream and melted butter…Oh this is gonna be good. Hi! there mushrooms, glad you could join us! Whats a party without parmesan cheese?!? Drain when done…Look at all that green. Definitely balances out the cream and butter, right?!? 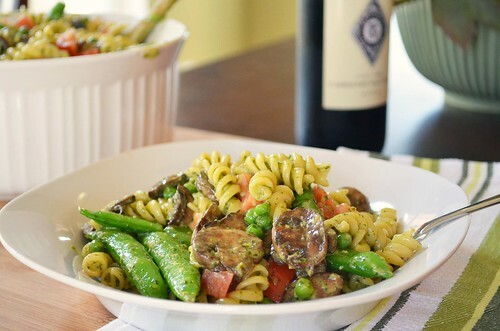 Sauce the pasta…Sauce is a verb – just go with it. Toss to combine and dinner is served! How easy was that?!? If you want, which I would highly recommend, and which I will be doing next time around, is add some grilled chicken or shrimp to the mix. How good would that be? If doing so, I would increase the sauce amount by about a quarter to half to coat everything well. Bring a large pot of salted water to a boil. Add pasta and cook until al dente. 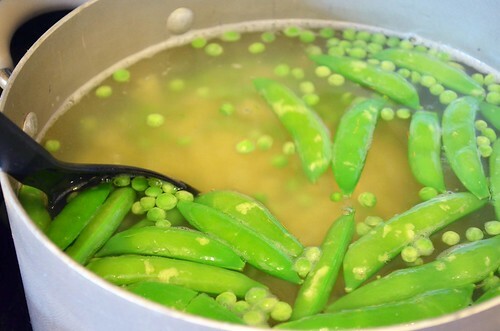 During the last 2 to 3 minutes of cook time add the sugar snap peas and frozen peas. When pasta is done, remove from heat and drain. 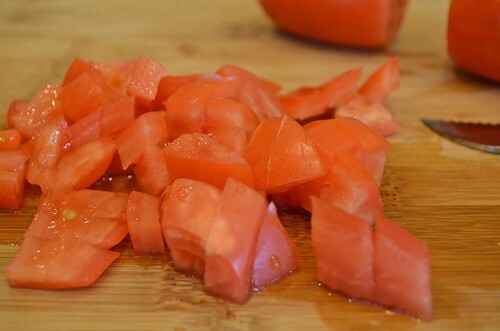 While the water is coming to a boil/pasta is cooking, prepare the sauce. 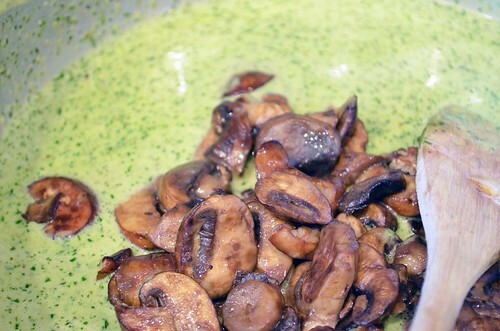 In a medium skillet over medium heat, melt 2 teaspoons of butter and then add the mushrooms. 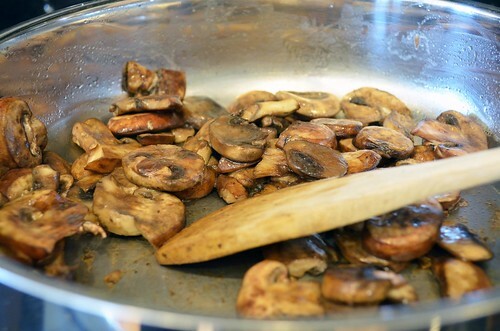 Saute mushrooms, stirring frequently, until tender. Remove from heat and set aside. 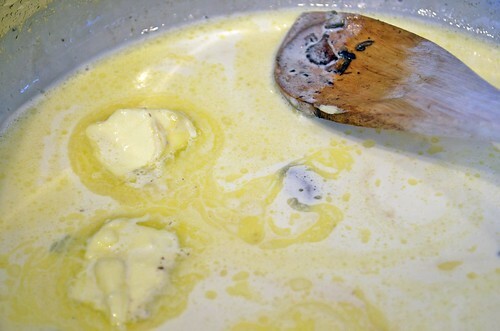 In another medium sauce pan/skillet over medium – low heat, add the heavy cream and 2 tablespoons of butter. Cook until butter melts, stirring frequently. 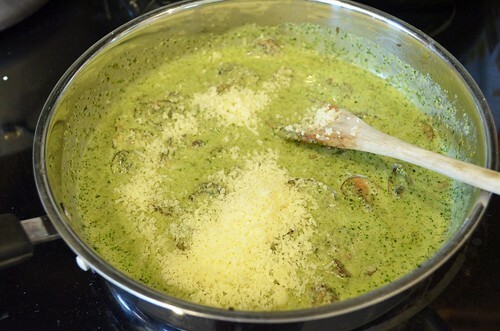 Once butter has melted, add the pesto, mushrooms, and parmasean cheese and stir to combine. Continue to cook until heated through. Reduce temperature to low if the sauce is ready before the pasta is. Stir frequently. 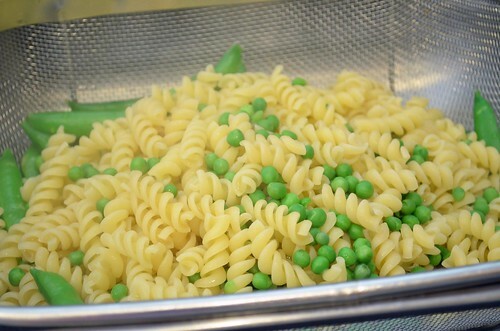 Transfer cooked pasta, peas, and snap peas to large serving bowl or pan. 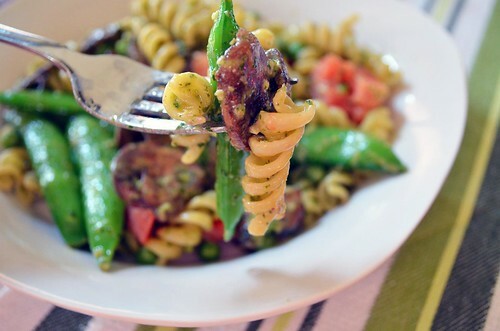 Pour the creamy pesto sauce over the pasta and add the tomatoes. Toss to combine. Serve!